2003 compilation from BR Music, Holland, licensed from Universal Music. On two CDs, we relive the music of a magnificent orchestra who served devotees throughout the world of quality, instrumental pop music in a fantastic way for a great many years. A formation, led by Bert Kaempfert, one of the most successful bandleaders/conductors, composers, arrangers and recording artists of the 20th century. Berthold Kaempfert, born on 16 October 1923 in a grey working-class district of the German port of Hamburg, was fascinated by everything to do with music as a small boy. After being seriously injured in a car accident, six-year-old Bert was given a piano by his mother. Once he had mastered that, Bert focused on other musical instruments including accordion, saxophone and clarinet. A school of music study was therefore simply inevitable and although his interest extended to all aspects of music, Bert Kaempfert was particularly interested in the American big bands of the late Thirties and early Forties - Benny Goodman, Harry James, Glenn Miller, and Tommy Dorsey. 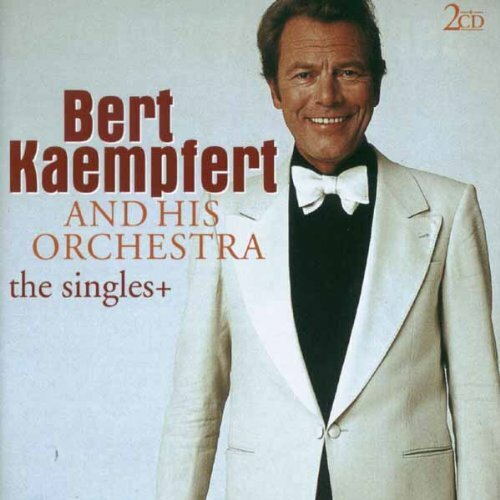 To himself lead a large orchestra was still a massive dream of Bert Kaempfert's. This was realised once the gun smoke of the Second World War had departed and Germany slowly began its musical rejuvenation. Bert Kaempfert went on various tours with his own orchestra, including visits to American military bases in West Germany. He was able to live it up to his heart's content in his favourite big band swing, while also carefully following the developments in popular music. When Polydor Records took him on as an arranger, producer and musical director during the second half of the Fifties, it wasn't long before Kaempfert scored massive hits such as 'Morgen' with the Yugoslavian singer Ivo Robic, as well as in 1959 with 'Die Gitarre Und Das Meer', sung by the Austrian Freddy Quinn. Prior to his big international breakthrough, Bert Kaempfert had already attracted attention in Germany with numbers such as 'Mitternacht Blues' (Top 10 in 1958 and 22 successive weeks in the charts) and 'Patricia'. And later came 'Wunderland Bei Nacht', the song written by Kaempfert as title song for a film about the dark side of Germany's 'economic wonder'. The piece recorded by his orchestra was not popular at his record company, but Bert passionately believed in the piece to such an extent that he travelled to New York in October 1959 to find an American publisher for 'Wunderland Bei Nacht', with the band recording in his pocket. After the customary rejections, the piece was eventually bought by Roosevelt Music. The legendary American producer Milt Gabler, famed due to his activities for Decca Records, promised to take care of the release in the United States. Once 'Wunderland' had become a mega hit in both Germany and Japan, the track went into the American Hot 100 charts in November 1960 - with the English title 'Wonderland By Night'. And that was just the start, as the moving trumpet solo, muted brass and sumptuous strings of 'Wonderland By Night' went to the top of the charts in American in January 1961. The beautiful instrumental had propelled Bert Kaempfert and his orchestra to international stardom. Several months later, found himself the subject of the music news in another way. After a visit to the Top Ten Club in Hamburg, he contracted the young English pop singer Tony Sheridan for a few recordings. Sheridan asked Kaempfert whether he could use the still-unknown Beatles as accompaniment in these recordings as the goup was also working at the Top Ten Club at the time. The producer had no objection to this and recorded several Beatles tracks on their own once the recordings with Tony Sheridan had been made, the American evergreen 'Ain't She Sweet' (with John Lennon on the lead vocals) and 'Cry For A Shadow'. Bert Kaempfert advanced the four musicins 300 German marks a man, worth around $125 in 1961, and changed their name to The Beat Brothers. He felt that this sounded better than The Beatles... Without knowing it at the time, Kaempfert was responsible for the first studio recordings by the group, who were later to make their mark on all pop music and become a household name. In 1961, Bert Kaempfert also reached the musical front pages as co-author of 'Wooden Heart', the English version of the German folk song "Muss I Denn". The Joe Dowell version of the track sung by Elvis Presley in the film 'G.I. Blues' reached number one in the American Hot 100 charts at the end of August 1961. With his own orchestra, Kaempfert released various instrumental pieces in 1961, including the attention-grabbing version of the American evergreen 'Tenderly'. Subsequent to the success of this track (seven weeks in the American Hot 100), the bandleader revived even more successes from the Great American Songbook that found their way to an audience of millions, in the immediately recognisable Bert Kaempfert style of course. Success such as 'Red Roses For A Blue Lady' (1965), 'Three O'Clock In The Morning' (1965), 'Bye Bye Blues' (1966) and 'I Can't Give You Anything But Love' (1966). In addition, the genial bandleader/arranger also conquered the world as composer - with music that stays with you for ever after having heard it a couple of times. We are talking fetching tunes such as 'Afrikaan Beat', 'Danke Schöen' and 'A Swingin' Safari', a track for which the studio recording by the Billy Vaughn orchestra was used as theme for the long-running TV show 'The Match Game'. Bert Kaempfert's success as composer was underlined by the five Awards, awarded to him in 1968 by BMI. Of the great many compositions by Bert Kaempfert, we would like to take one or two to one side. First of all 'Moon Over Naples', written as an instrumental, the vocal version "Spanish Eyes" having been a hit in 1965 for Al Martino. A year later came 'Strangers in The Night', a piece that was originally an instrumental and for which was composed for the film 'A Man Could Get Killed'. It found its way to producer Jimmy Bowen, who with 'Wonderland By Night' and 'Wooden Heart' (Kaempfert's number one hits in American) in his thoughts, asked the music publisher to come up with English lyrics for 'Strangers' as soon as possible. Bowen was firm in his belief that nobody less than Frank Sinatra was fit to sing this song. The lyrics arrived and what happened next is well enough known: Frank Sinatra hit top spot of the American Top 100 in July 1966 with 'Strangers In The Night', the song also reaching number one in the UK. The next year, Sinatra saw to it again that he achieved success with a Bert Kaempfert composition, 'The World We Knew (Over And Over)'. For Kaempfert, whose admiration for American music had started with the big band sound that originated at the start of Sinatra's career, this meant a personal triumph that such as world star as Sinatra took his compositions and used them for his repertoire. Just like the great satisfaction for him as jazz and swing fan when Nat 'King' Cole, another major American song stylist, perpetuated his song 'L-O-V-E' at the start of the sixties. Around 1970, it became clear that although the charts were becoming less kind to him, the influence of Bert Kaempfert on the popular culture of the previous years was unmistakeable. Kaempfert had given The Beatles their first chance in the recording studio. He had got an older generation of music devotees dancing to the sounds of 'Wonderland By Night' as well as a great deal of other instrumental works. He had got millions of people humming to tracks such as 'That Happy Feeling', 'Afrikaan Beat' and 'A Swingin' Safari'. And he had provided fans of romantic songs with one of the most beautiful melodies of the Sixties with 'Strangers In The Night'. The record of the Bert Kaempfert Orchestra still sold well during the Seventies and the band went on regular tours of Europe. When disco became popular around 1975, Kaempfert did not hesitate to record a disco version of Isaac Hays' 'Theme From Shaft'. In doing this, he showed that he was capable of moving with the musical times and was still very interested in all the developments within popular music. And he would definitely have carried on performing were it not for the unexpected end to a life full of music, which came on 21 June 1980 owing to a sudden heart attack at his home in Mallorca, where he was taking a break from a successful tour of the UK. Bert Kaempfert. Even though we are in the first decade of the 21st century, the sell-by date of his music has not yet passed and it is still a real treat to listen to his compositions and his execution of well-loved melodies from the archives of American popular music. The two CDs that are enclosed exhibit the notable class of Bert Kaempfert's work, which cannot be taken in superlatives, and thousands of recognisable 'sounds'. Tracks that not only still enthrall older listeners, but which also bear a purely musical prize for the younger generation of real music devotees.